1/ Find the folder containing the new avatar skin, shape etc in your inventory. 2/ Hover your cursor over the folder and hold down the left mouse button. 3/ Drag the folder onto your avatar then release the left mouse button. 4/ The new avatar skin, shape and anything else in the folder will now rez onto your present avatar. 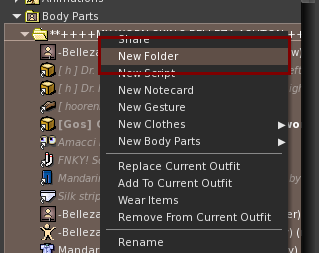 If you do not add clothes to this folder, when you do a quick change your avatar will be naked. Adding clothes will mean you can do quick changes safely in a public area. If your usual avatar came with a number of shapes, or you have edited the shape you normally wear, it is a good idea to give it a name that will allow you to identify it from other shapes before you take it off. Other things you may want to add to the folder might be jewelery and any huds you wear. 1/ Open your inventory and pick a standard folder such as the Body Parts or Clothing folder. 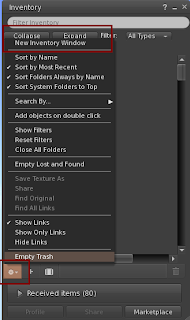 2/ Right click on the folder and from the drop down menu click on New Folder. 3/ Give this new folder a recognizable name so you'll know what it contains. 4/ Now find the folder that contains your skin and shape. 5/ Open it and find the skin you wear. Right click on it and from the drop down menu select Copy. 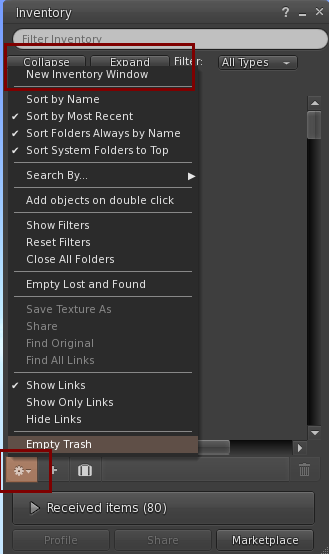 6/ Go back to the folder you created for your skin, right click on it and from the drop down menu select paste. Your skin will now have been copied to this folder. 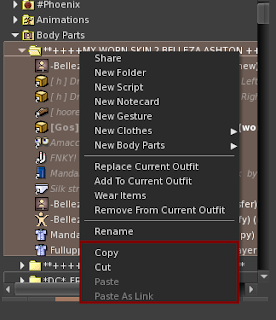 7/ Follow the steps explaining how to copy and paste items in your inventory until your new folder contains everything you need to do a quick change. 8/ Now that this folder contains everything you usually wear, every time you want to change back to your preferred avatar skin and shape etc, you can simply drag the folder onto your avatar. Remember to add a set of clothes to the folder or you will be naked when you change back to your usual appearance. You can see from the image above that once you have clicked on 'Copy' you are given the choices of either pasting the item to a folder, or 'Paste As Link'. Paste As Link is preferable because it allows you to add the item to different folders. 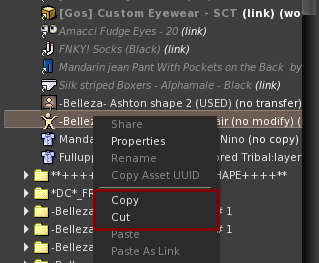 Pasting as a link allows you to copy and paste items of clothing to a folder to make up an outfit. The same item of clothing can then be pasted to different folders and can be used in a number of outfits. pasting it as a link to your new folder. Once you have created a folder with an outfit you can again drag the folder onto your avatar and thereby do a quick change. 1/ look at the bottom left of your inventory window where you will see a cog shape, (click on the image above to enlarge it). 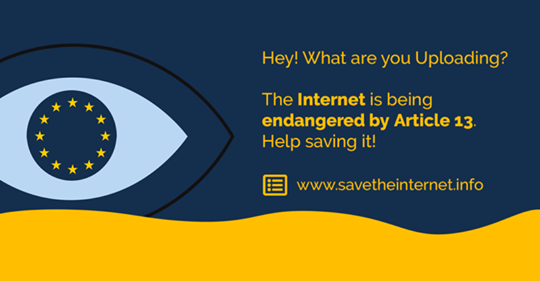 2/ Click on this which will open a drop down menu. Now your screen will display two inventory windows. Learning how to do quick avatar changes can save a lot of time instead of adding one part of an avatar piece by piece, or searching through your inventory to find a particular item of clothing. Some residents also find it fun to create outfits for themselves. Once you give it a try you will find it a handy tool.